Sixty-four years ago tonight a U.S. Air Force bombardier saw something over western Kansas that still spooks UFO researchers. It had to be startling. Ethereal. The kind of thing that would make your skin crawl. This real-life X-file started out routinely for First Lt. Ralph H. Bauer Jr.
Bauer was seated in the glass-enclosed nose of a B-29 Superfortress, the same kind of long-range warplane used to drop the atomic bomb a few years earlier on Hiroshima, Japan. The B-29 was heading east at 30,000 feet, flying above the cloud ceiling, which was 2,000 feet below. It was about 10 p.m.
Bauer could clearly see the stars and the moon. Out of nowhere the UFO was ahead of him at about a 45-degree angle. He described it later to a Project Blue Book investigator, Lt. Col. George A. Hanselman, director of intelligence of the 90th Bombardment Wing M, stationed at Forbes Air Force Base in Topeka. It pulsated three to four times as it passed over the top of the plane at high speed and then out of Bauer’s vision, which was blocked by the B-29’s frame. He estimated it took only two seconds to pass by. But he remembered every detail, which he gave to Hanselman. What he saw was a bright light — he called it fan-shaped, as in the kind of fan you would hold in your hand that is narrow at the bottom and wider at the top. A rough sketch is included in the documents. Hanselman calculated the speed of the object as about 2,000 mph. It turns out that Bauer’s sighting that night was to be one of the first that year of what many researchers claim might have been an invasion of UFOs in 1952. The Project Blue Book archives contain 196 “unexplained” sightings in 1952. These are my own counts of the 196 unexplained cases in 1952, by month: January, one; February, two; March, three; April, 17; May, 12; June, 37; July, 49; August, 26; September, 26; October, 12; November, eight; December, three. That’s a lot of unexplained cases in one year, considering there were only 701 such cases the Air Force documented in the 21 years that Project Blue Book was in operation. There was probably a good reason that the military didn’t make the Goodland case — and many of the others — public. Timothy Good, a British UFO researcher, says in his book, Need to Know: UFOs, the Military, and Intelligence, the U.S. military and other governments that sent planes up to intercept UFOs were losing planes and pilots — the UFOs were knocking them out of the sky. Was the Goodland sighting part of an invasion force? There are still so many questions out there after more than six decades that it’s difficult to sort through what’s speculation and what is reality. I’m still keeping an open mind as I sort through more documents. There’s an old UFO tale that always sends the needle on my skeptical meter into the red danger zone: The claim that President Dwight Eisenhower met at least once, maybe several times, with extraterrestrial aliens during the mid 1950s. Despite my own misgivings, the stories seem to continue to thrive in UFO lore. As I was researching my book, UFO Cold Cases: Kansas, I ran across some material I didn’t include in my book — writings and videos about what happened during Ike’s mysterious disappearance during a “vacation” trip to Palm Springs, California, in February 1954. Eisenhower, a native of Abilene, Kansas, was a military genius who became the Supreme Allied Commander during World War II. He was elected president during the 1952 election and served two terms through 1961. His presidency covered the time period when the U.S. Air Force’s Project Blue Book investigators were regularly keeping track of thousands UFO sightings around the world. The Blue Book documents don’t have anything about the alleged visit. But I did find a documented UFO sighting the following night in the nearby Los Angeles suburb of Van Nuys — something I’d never heard before. Here’s a condensed version of the Washington Post’s feature story in 2004 on the 50th anniversary of the tale. WaPo reports that on Feb. 20, 1954, Eisenhower “interrupted his vacation in Palm Springs, Calif., to make a secret nocturnal trip to a nearby Air Force base to meet two extraterrestrial aliens. The WaPo story talks about the now 62-year-old dispute between Ike’s official biographers and those who claim his emergency visit to the dentist for a chipped tooth was just a cover story. Michael Salla, a UFO researcher whose theories are on Exopolitics.org, expounds the theory that Eisenhower went unannounced to Edwards Air Force Base, where he met with two “Nordic” aliens, so-called because their white hair, pale blue eyes and colorless lips make them resemble Scandinavian humans. Salla claims the Nordics, who communicated telepathically, wanted to make a deal: If Ike would eliminate the U.S. nuclear weapons stockpile, they would share their superior technology and spiritual wisdom. Ike turned them down. Salla also claims another race of ETs, known as the “Greys” — also met with Ike later that same year and made a deal “allowing them to capture earthling cattle and humans for medical experiments, provided that they returned the humans safely home. Since then, Salla says, the ‘Greys’ have kidnapped ‘millions’ of humans,” according to the WaPo story. However, the WaPo story goes on to say that the archivists in the Eisenhower Library in Abilene laugh off the story and others like it. And that would seem to be the end of it. Or is it? As I said earlier, I searched through the Project Blue Book documents available online to see what might have been reported around that time. I found a two-page document that seemed to be out of place in the files. The name of the informant was blotted out, but the details were a little bit strange, given the Ike UFO story. Could this sighting be a smoking gun for the Ike story? The memo says the informant reported he had seen two flying saucers about 11 p.m. Feb. 21 as he was returning to his home in Van Nuys. The man said he was unlocking his garage door when he saw an object in the sky that he recognized from written accounts as a flying saucer. He called to his wife and mother, who were still in his car, to look at it. His next-door neighbor, (name blotted out), a former Marine Corps pilot, and the neighbor’s wife also came outside to see what was going on. Then the group saw a second object approaching from the north. The two men in the group, who were both pilots during World War II and had flown about 2,000 hours, reported they had seen many natural aerial phenomena, such as St. Elmo’s fire — but the objects they saw were nothing like that. They described the objects as luminous, reddish in the center, with an electric-blue luminosity at the edges which seemed to flash in a bluish halo as they turned. They also said the UFOs were elliptical and seemed to be transparent. Meanwhile, below is a 2013 video of a dying man who claims he worked for the CIA and was involved in UFO investigations. In the video, he claims he was sent by Eisenhower to Area 51 where he ended up seeing the Roswell crash remains and where he saw a live “Grey” alien. Comments Off on Did ET like Ike? Did you know many UFO researchers believe the U.S. came as close as it ever has to what might have been an alien invasion 64 years ago? Thousands of sightings were reported in 1952 all over the country. For example, seven blips were seen on radar heading to the White House. However, nearby military jets that were sent to shoot them down couldn’t keep up — the UFOs disappeared from view on the radar, then returned after the military fighter jets left. Were they real? Has our government told us everything they found out? 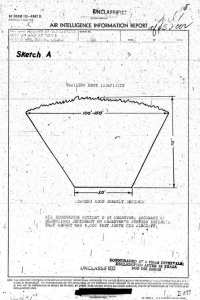 Before you dismiss the invasion idea as far-fetched science fiction, you might want to check out some of the official UFO government documents from that year. Among those was a sighting in April 1952 north of Goodland in the northwest corner of Kansas. That particular sighting was taken seriously by the top Air Force investigators who were assigned to probe into unusual unexplained aerial phenomena. What happened 64 years ago this month is that a U.S. Air Force bombardier flying in a B-29 about 30,000 feet above Goodland, Kansas, saw something that still remains a mystery today. That sighting is part of Project Blue Book’s real-life X-files cases — those cases that still have no plausible conventional explanations. In Chapter 6 of my book, UFO Cold Cases: Kansas, I go over the bombardier’s story: He saw a large fan-shaped light traveling at an impossible speed across western Kansas skies. I went through the available details in the documents that have eventually made their way to the public arena for study. I also found out that same day, April 29, 1952, the Air Force top brass put a lid of secrecy on all such reports: They issued written orders that none of the military reports they were generating should be passed on to local media. Why? Wouldn’t it be helpful to find out if any civilians in the area saw the same things? Meanwhile, three months after that April 29 Goodland sighting, Major Gen. John Samford, who was then the USAF director of intelligence, tried to quell the public’s fears about flying saucers. Samford spoke in a press conference following the Washington, D.C., sightings in July 1952. We don’t have the entire transcript of the press conference, but we can watch an old black and white film, (which might be heavily edited) that was made available by the National Archives on YouTube.com. In the black and white film version, Samford tells the off-camera reporters that as of July 1952, the Air Force had analyzed between 1,000 to 2,000 UFO reports. Most of those were explained away as hoaxes, friendly identified aircraft, meteorological or electronic phenomena, or as light aberrations. He said the Air Force was still attempting to resolve those reports, which we can surmise were the “unidentified” reports we find listed in the documents that have been released to the public. However, in the black and white film, Samford quickly came out with a statement apparently designed to put the public at ease about the rash of sightings that year. The Air Force had come to one conclusion about the remaining group of unsolved cases: That group “does not contain any pattern of purpose or of consistency that we can relate to any conceivable threat to the United States,” Samford said. He was obviously referring to any “conceivable threat” from the Russians or from any other country that might have been hostile. On the film, Samford also appeared to be answering a reporter’s question if the sightings could be those of our own secret aircraft tests. But Samford insisted the 1952 sightings were in no way connected to any secret development by any U.S. department or agency. In other words, nobody on earth — not the Russians or even our own engineers —had the technology that could produce the kinds of sightings that credible people were reporting that year. And that was that, as far as what Samford was willing to say about it. The military would not answer what many members of the press and public really wanted to know: Could the UFOs be a conceivable threat from a technologically superior civilization that might be visiting this planet? While Samford didn’t touch on that question, we know others were looking into the extraterrestrial possibility. At the end of Samford’s statement on the black and white film, another man who is wearing civilian clothing sits down at the two microphones. It was Donald Keyhoe, a former Marine Corps major who had just authored the book, The Flying Saucers Are Real. In the years that followed, Keyhoe went on to become one of the most respected civilian investigators of UFOs in the country. He also was a founding member of NICAP, the National Investigations Committee on Aerial Phenomenon. In his short statement on camera, Keyhoe said that, with all due respect to the Air Force, he believed some of the 1952 sightings would be found to be of interplanetary origin. Keyhoe says on camera that one plane was buffeted by a solid object estimated at 500 mph — an object he thought had probably originated in space. Probably due to the newness of filmed press conferences, Keyhoe’s statement was very brief. It would have been interesting to listen to him talk for much longer. Unfortunately Keyhoe probably didn’t know about the UFO event over Goodland, Kansas, a few months earlier and that it featured an object that was estimated traveling at 2,000 mph. And that would have given Keyhoe even more of an argument for the extraterrestrial hypothesis. It’s too bad Keyhoe couldn’t have asked Samford at the press conference which earthly government had the technology at that time to travel at 2,000 mph.